Premiere: October 12, 2018. Sala Ponce, Palacio de Bellas Artes; Mexico City, Mexico. Cuarteto Latinoamericano. 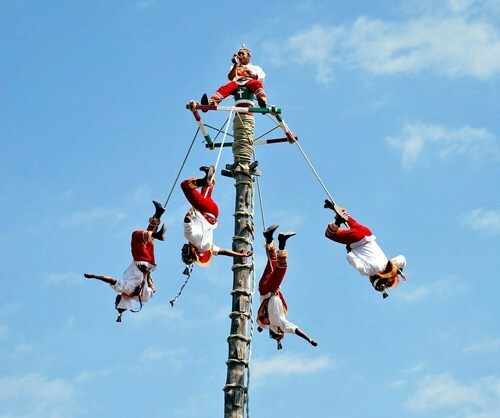 The ancient Mexican ritual of the Voladores de Papantla (Papantla Flyers), in which a priest and four flyers climb an 80-foot pole, tie themselves with ropes, and launch into the air, was originally created to ask the gods to end a severe drought. Nowadays, the ceremony is widely performed as a thrilling spectacle throughout the country, particularly in the city of Papantla in the Mexican state of Veracruz. 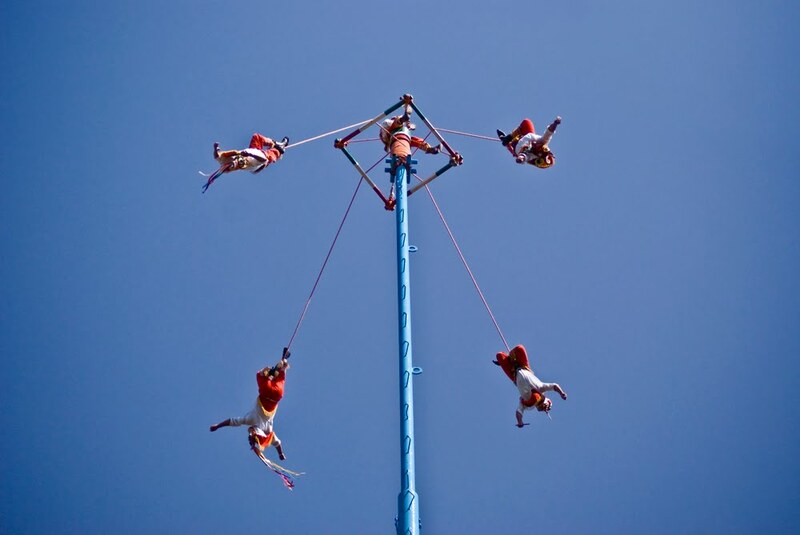 Cast in seven continuous sections, my string quartet Voladores de Papantla is a musical narration of this ritual. The inspiration for this work came from envisioning the four Papanlta flyers as members of a string quartet, closely working together to achieve a challenging task, and the priest as a composer (myself) who invents the music that’s performed during this rite. Together, we embark on this adrenaline-charged journey that features dancing, praying, and flying. The ceremony begins when the priest plays the “Forgiveness Song” (“Son del Perdón”), with his small flute and drum, to ask forgiveness from the gods for having cut down the tree (nowadays replaced by a metal pole) that they will climb to perform this ritual. The four flyers join him, circling around the pole while dancing, as they mentally prepare for their “Ascent” (“Ascenso”). One by one, they then climb the towering pole. Once they reach the top and settle into their sitting positions, the priest blesses each of the flyers with a melody, hoping that his “Benediction” (“Bendición”) will protect them during their flight. He then stands on the pole, without a harness, and performs a “Dance” (“Danza”) on it, wildly stomping his feet to ensure that the pole is firmly nailed to the ground. When the four flyers have tightly secured themselves with ropes, they drop backwards into the air to begin their “Flight” (“Vuelo”) to the ground. As their ropes unwind, the flyers spin around the pole, gradually descending until achieving a safe “Landing” (“Atterrizaje”) on the earth. Finally, the priest climbs down the pole and then plays a “Farewell Song” (“Son del Adiós”) to conclude the ceremony. 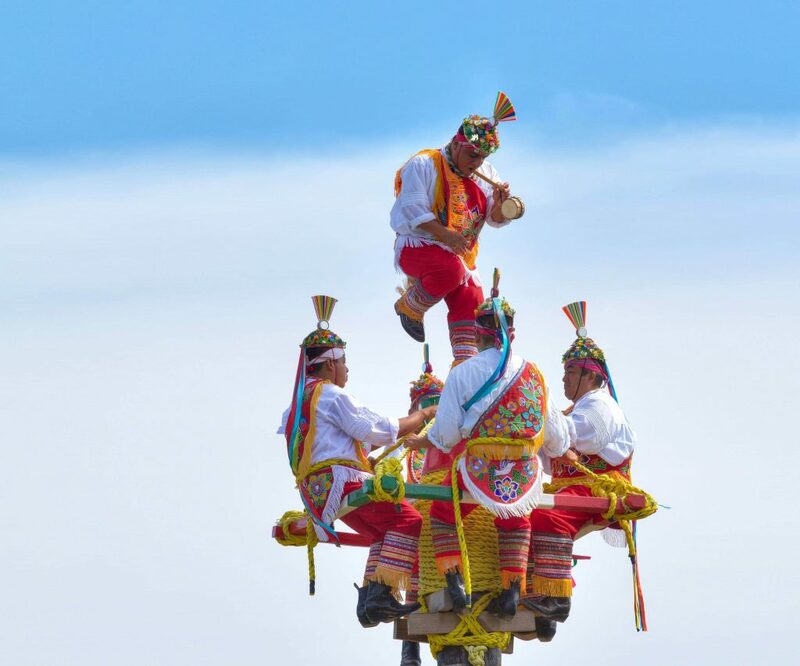 Voladores de Papantla is dedicated to the Cuarteto Latinoamericano, a group of four “flyers” who have championed Latin American string quartet music for more than thirty-five years. November 12, 2018. Hancock Park; Los Angeles, California, United States. Los Angeles Chamber Orchestra. October 12, 2018. Sala Ponce, Palacio de Bellas Artes; Mexico City, Mexico. Cuarteto Latinoamericano.